2018 3DCart review – Themes, pricing and more reviewed! » 2018 3DCart review – Themes, pricing and more reviewed! This 3dCart review has been updated in February 2018. 3dCart is one of the oldest e-commerce software platform providers on the internet. And in fact they have been around for more than 15 years which is longer than some of their main competitors put together! However old doesn't always equal good and in fact if a software company was just old and hadn't made lot of updates and improvements recently to their software it might even be a horrendous thing. And that is especially true in the highly competitive industry of e-commerce where customers are constantly judging e-commerce websites based on how they look, on how they work and on how good the overall shopping experience is. In this 3dcart review we will look at 3dcart and see how it stacks up against its younger rivals. The first thing you might notice when arriving to the 3dcart's homepage is that they are offering a nice 15 day free trial for all their customers. Free trials are extremely common with the successful e-commerce platforms and they also tend to be around the same length: about two weeks. 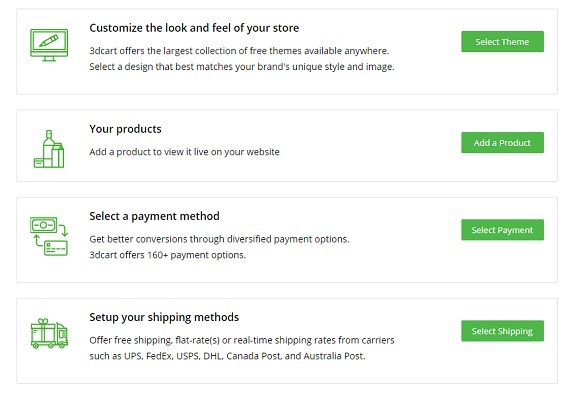 Shopify, for example, offers a 14 day free trial to their new customers. When you start the registration process for 3dcart it quickly becomes apparent that the company has done everything it can, to make it as painless and as quick as possible. You are not asked for ton of personal details, you don't have to give credit card or other payment information and there is no link sent to your email that you have to click before you can start building your online store. 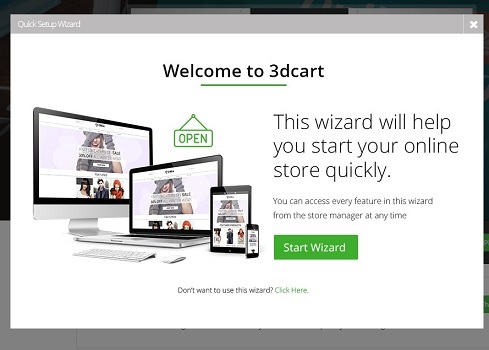 Instead you can start building your store quickly with the help of their extremely useful 3dcart wizard which guides you through the process of creating your own webstore. Howerver, it is good to note that using the wizard is completely optional and if you already have practice with building your own online store you might want to try building the store without the wizard. Go to 3Dcart now and start building your store! 3dcart offers both free and premium themes. The collection of the free 3dcart themes is especially impressive. At the time of writing this the company has more than 50 completely free themes for you to use for your store. The number of the free themes is massive when compared to, for example, Shopify which only offers around 10 free themes to their customers. And best of all these free 3dcart themes also look quite nice. They are not the flashiest e-commerce themes around, but will certainly do the job if you are on a tight budget and trying to build an online store inxpensively. As mentioned 3dcart also has premium e-commerce themes. At the time of writing this there are actually fewer paid premium themes than there are free themes. The number of the premium themes is bit below 50. The one time fee for a specific premium theme ranges from $99 to $199. However, 3dcart also offers a service in which you can for $249/year use an unlimited amount of different premium themes. In my opinion this is an extremely nice innovation by 3dcart and could certainly be worth considering buying if you like to test how effective the different templates are or you are more passionate about e-commerce in general than you are about certain product category, and as such might change the direction of your online business at some point during a year. 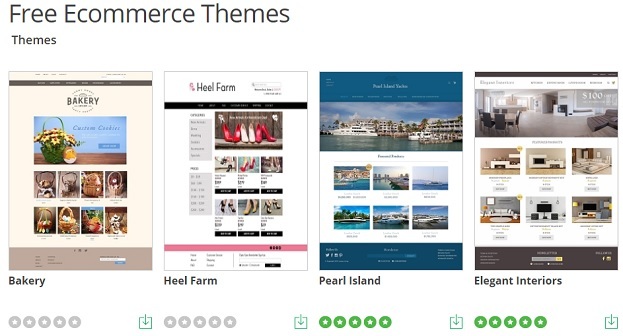 The premium themes look on average bit nicer than the free themes, but there isn't a huge difference - so you certainly don't HAVE to buy a premium theme for your store when you are getting started. However, as the themes are relatively cheap when compared to the amount of revenue you are likely trying to do with your store, it might be a good idea to invest into a theme that you really like. It is good to keep in mind that you can often recoup the investment made into a premium theme by simply getting couple more customers than you would have gotten with a free theme. What is striking about the 3dcart templates, is the fact that they are very heavily focused on showcasing a broad range of products on your homepage. This is a big difference when compared to, for example, Squarespace which is better suited to showcasing couple products. So if you are running a business that sells lot of different products, it might be an especially good idea to go with 3Dcart. In general I would call the 3dcart templates as more traditional type of e-commerce themes than the e-commerce templates offered by most of their competitors. This means that if your customers tend not to be very young, 3dcart might be a great choice for you. Naturally the 3dcart themes automatically adjust to different screen sizes. This means that your customers can easily buy from your store, regardless of if they are using an old PC or a modern mobile phone. Open your 3Dcart account now! How easy is 3dcart to use? The one word answer to the above question would be: Extremely. 3dcart has really paid lot of attention to designing the back-end of the e-commerce platform in such a way that anyone can easily use it for starting an e-commerce store. Things such as adding products to your store, choosing the theme for your e-commerce business and selecting payment methods to offer to your customers are very easy to do. In addition to that what I really like about the 3dcart store builder, is that there is nothing unnecessary - nothing that will confuse you when you are trying to create your store. In total 3dcart offers 5 different plans to choose from. However, only 3 of them are usually worth considering for the average e-commerce store owner. The 3dcart basic plan costs $29/per month when paid monthly and $26.1/per month when paid yearly (so 10% discount). Under the basic plan you can add an unlimited amount of products to your store, have no transaction fees on sales and an unlimited amount of visitors can come to your store. The "unlimited amount of visitors" feature is especially important these days when social media can make online stores go viral and bring an incredibly surge of traffic to your store. The basic plan also comes, for example, with the ability to offer gift cards. This can often be considered to be a nice benefit in choosing 3dcart as its main competitor, Shopify, doesn't offer the ability to have gift cards in stores created with their basic plan. The 3dcart plus plan costs $79/month when paid monthly and $71.1 when paid yearly (so again the 10% discount for a yearly plan). The plus plan contains all the same features as the basic plan, but in addition to that your also get, for example, the chance to offer daily deals with a countdown on your site, the ability to offer group deals and the ability to make it possible for customers to make their own offers for the products you sell. The pro plan costs $229/month when paid monthly and $206.1/month when you pay for the full year in advance. Th pro plan has all the same features as the plus plan, but in addition to that you get, for example, the ability to offer product Q & A on your online store. In addition to the mentioned basic, pro and plus plans 3dcart also has a startup plan and an enterprise plan. Under the startup plan you can sell at most $10,000 worth of products in a year, and as such it is not worth considering for most people starting an e-commerce store. The price of the startup plan is $19/month, and as the price is at most $10 cheaper than the price of the basic plan, it is very likely better to just go with the basic plan if you are choosing between the startup and the basic plan. The enterprise plan on the other hand is intended for those who are running a very large e-commerce store. The price of the enterprise plan will be negotiated on individual basis. All in all the pricing of the 3dcart plans and the features of the different plans are pretty much in line with its main competitors. However, it is worth mentioning that at 3dcart every store owner gets a free SSL certificate for their store. This is a nice little advantage when compared to, for example, Volusion where you have to buy it separately for your store. At the time of writing this there is no special 3dcart coupon or discount code. You will simply get the 10% discount by choosing a yearly plan instead of monthly plan. Should you choose 3dcart for building your online store? In this 3dcart review we have looked at the most important features of 3dcart and compared the platform to some of the other most popular e-commerce platforms. Based on this it can be concluded that 3dcart offers a very competitive option for building an online store. In my opinion 3dcart is an especially good option for those e-commerce store owners who are looking to sell a wide range of products and maybe have a clientele that tends to consists of slightly older online shoppers. If you are looking to sell just two or three hot fashion items to teenagers, 3dcart is probably not the best option - in that case you should maybe try Squarespace - however in other situations 3dcart is certainly worth trying. Get started with 3Dcart now! Moi! Mun nimi on Atte. Olen kiinnostunut verkkokaupan pyörittämisestä ja lainoihin liittyvistä asioista. Näiltä sivuilta löydätkin siis esimerkiksi tietoa verkkokaupan perustamisesta sekä pikalainoista.